Our spacious, thoughtfully-designed apartments offer one, two, three, and four bedroom floor plans. Features include garden and townhome style apartments, fully equipped kitchen, generous closets, central air and heat, and in-home washer/dryer. Select apartments offer attached garages, granite countertops, and storage units. At Floresta you are privileged to many community amenities, including heated and chilled resort-style swimming pool, 24-hour fitness center, clubhouse with complementary Wi-Fi access, detached garages, and private lake with walking path. Our pet-friendly community welcomes you and your four-legged family member. 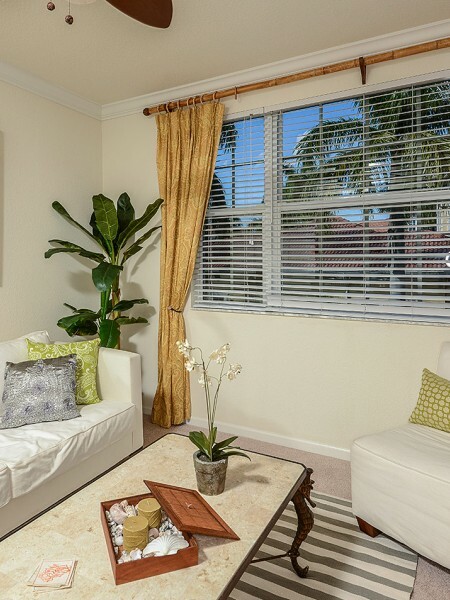 You will find easy access to Abacoa Town Center, PGA Boulevard, I-95, and the Florida Turnpike, plus you are only minutes from some of the best restaurants, shopping, and entertainment Jupiter, FL has to offer. Leasing specials/rental amounts apply to new residents only on select apartment homes and are subject to change.